Free 4 night stay at Royal Kona Resort too! The Big Ones are here. An 800 and a couple 600’s released yesterday! Enter any tournament by April 1, 2019 and be eligible to win a $500.00 credit on your account – AND – a 4 night stay in an ocean view king room at the Royal Kona Resort. Click the Royal Kona Resort Banner ad to reserve a room at a special rate for tournament participants. Defending 2017 & NEW 2018 Series Champion Angler Rick Shedore with the only marlin weighed at the 2018 Firecracker Open. 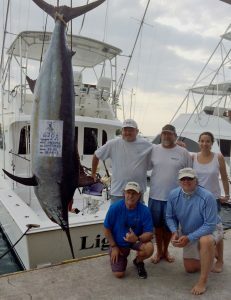 Rick (left standing) caught this 667.5 pound blue on “Lightspeed” with Travis Ota, owner Rob McCarthy and Capt. Rob Ellyn. 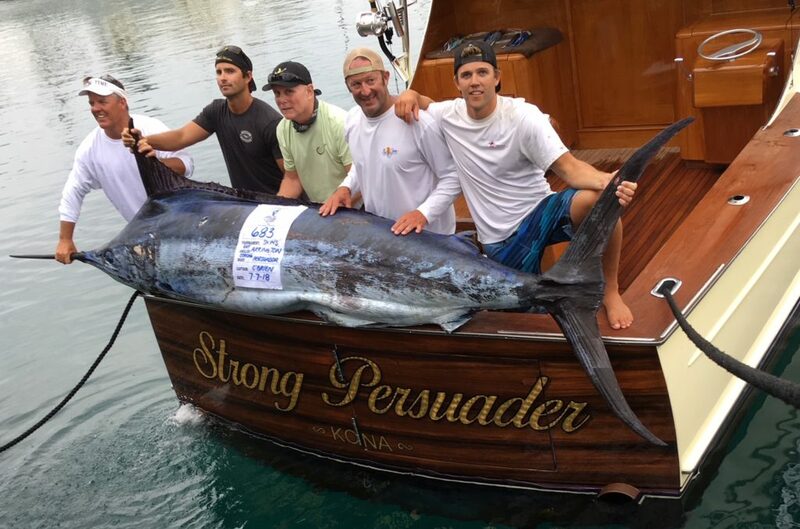 “Strong Persuader” crew with a 683 pound blue by Guy Arrington on Day Two of the 2018 Skins Marlin Derby. This fish earned them two “Skins” and a whole pile of day money. L to R – Allen Stuart, Capt. Shane O’Brien, Guy Arrington, Lance Fudicker and Charlie Bowman. PRESENTED BY KOYA LURES OF KONA! FollowS the HMT Series Points scoring system, so that all teams in the running can Wrap the season competing for all possible points. See Individual Event Rules and the HMT Series General Rules for Contest related refunds such as when no qualifying fish are caught in a specific category etc. “BWANA” SWEEPS TOP HONORS AT FINISH OF THE 2017 HAWAII MARLIN TOURNAMENT SERIES! Scott Brickell of Los Angeles caught this 670 pound blue – the largest marlin of the 2017 BIMT on board “Huntress” with Capt. Stymie and crewmen Tim Hicks and Dana Boardman. Scott also tagged a second marlin for a total of 870 points, and this was the First Place fish in the tourney. Rick Shedore of Orange County, CA had a great weekend with a rare black marlin (above) weighing in at 620.5 pounds on day one and a 594.5 pound blue (below) on day three of the 2017 BIMT. Rick was fishing on board “Lightspeed” with Capt. Rob Ellyn, crewman Scooter Johnson, Patty Flores and boat owner Rob McCarthy III. 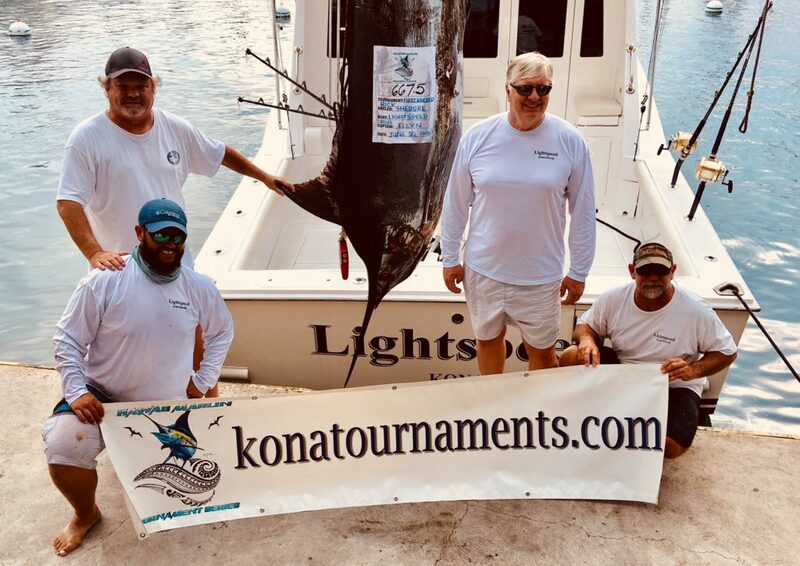 This team earned 2nd and 3rd largest marlin and a total purse of $163,140.00 with 1,215 points. 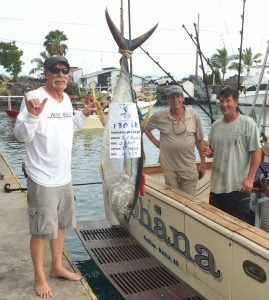 Bill Burns weighed the largest ahi of Day One from “Ohana” with Capt. Battersby. 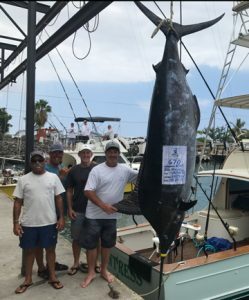 Tipping the scales at 130 pounds, it earned some day money and is in the lead of the Ahi Division. 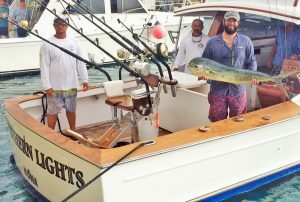 Joe Pezza Jr. holds the leading Mahi Mahi after Day One of the Kona Kick Off – a 25 pounder caught with Capt. Kevin Nakamaru on board Northern Lights. The BIG Ones at Kewalo. 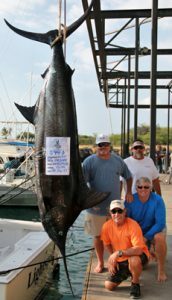 The largest marlin at the Kewalo Big Fish Chase Tournament – June 11, off the island of Oahu. 530 lbs. caught on board “Ruckus” with Capt. Ray Collier. 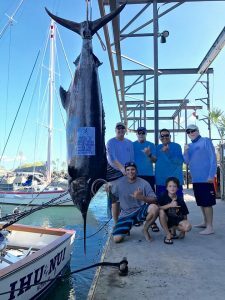 The largest ahi at the Kewalo Big Fish Chase Tournament. This 198.5 pound beauty was caught on board “Whip Saw”. Capt. Don Hackman at the helm. In the background are two of Howard Hughes Corp.’s additions to the Honolulu skyline.